With proper care, the Green or Carolina Anole, Anolis carolinensis, is quite willing to breed in captivity. However, being relatively inexpensive, it is often considered a “beginner’s pet” and not worthy of serious attention. This is a serious mistake, as anoles of all species are among the most interesting of all lizards. In fact, the antics of a colony of Green Anoles that I exhibited at the Bronx Zoo regularly stole attention from the more “dramatic” but sedentary Water Moccasins that shared their quarters. What’s more, we still have much to learn regarding Green Anole reproduction…hatchlings can be difficult to rear, and second-generation breeding is rare. There’s plenty to challenge the well-experienced keeper, and information gathered will likely be applicable to rare and less-studied relatives. 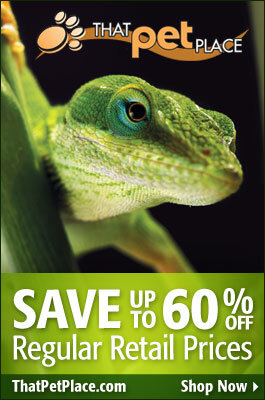 You can read about how to breed Green Anoles, Brown Anoles, Bark Anoles and many others below. However, over 350 anole species have been described, and details vary. Please post below for specific information on other anoles. A proper habitat and well-nourished, healthy animals are essential for breeding success. When conditions are not ideal, reptiles respond by eliminating non-essential activities such as breeding. Green Anoles kept in bare, cramped terrariums and fed upon crickets and mealworms alone will not breed. Please see this four-part article on Green Anole Care and Natural History for further information, and be sure to post any your questions below. The Green Anole’s breeding season extends from April to September. Males display with vigorous head-bobs and flared dewlaps. The dewlap reflects ultraviolet light and is perceived by the female as more brilliant than the red coloration that we see. Males actively pursue females and, using their mouths, grasp them by the neck during copulation. Please see the articles linked below for notes on distinguishing the sexes. One or two eggs are deposited 2-4 weeks after mating occurs. Most females leave them on or just below the substrate, along a log or other structure, although some bury eggs in soil or secrete them below leaf litter. Many individuals will deposit eggs above-ground if possible. Hanging live plants surrounded by a substrate of sphagnum moss and coconut husk make ideal sites. The “pool areas” incorporated into Hagen Smart Plants (intended as a deposition site for Poison Frog eggs) might be attractive to gravid anoles if filled with damp moss; I hope to try this out shortly. Females seem able to retain sperm, but most mate several times each season. Additional clutches are produced at varying intervals, to a total of 8-10 eggs per female. Breeding may occur spontaneously, but will be more likely if your anoles are subjected to cyclic changes in temperature, light and humidity levels that mimic natural seasonal variations. The Green Anole’s huge range extends from Oklahoma and South Carolina through Florida to Cuba and other Caribbean islands. A 6-8 week “winter” featuring reductions in temperature, humidity, and day-length is very effective in bringing them into breeding condition. Populations in the northern portions of the range experience longer and cooler winters than do those from the south. Most pet trade animals, however, are collected in central/south Florida and Louisiana. Anoles do not require true hibernation or brumation. During the cooling off period, daytime temperatures can be kept at 81-83 F, with a warmer basking site available. At night, temperatures should be allowed to dip to 62-68 F (60-65 F if your anoles originated in the northern portion of the range). The daytime light cycle should gradually be reduced to 8 -10 hours. Mist once daily, but be sure that the anoles are drinking regularly. Lowering the humidity is not as critical as daylight and temperature reductions. After 6-8 weeks, gradually increase day length, temperature, and humidity. Providing a wide variety of novel food items is a time-honored way of inducing reproduction in a wide variety of species. Try offering small roaches, silkworms, and wild-caught caterpillars, leaf hoppers, moths, beetles, earwigs and other invertebrates. Reptile misters and foggers can be used to dramatically increase humidity levels as the breeding season arrives. Please see these articles for further information on collecting insects. Eggs may be incubated in vermiculite or moist sphagnum moss. I prefer to use a vermiculite and water in a 1:1 ratio by weight (please see this article for details on setting this up), but success has been had by adding just enough water so that the substrate barely holds together when squeezed. The incubation container (a plastic deli cup will do) is best kept in a small commercial reptile incubator at 82-88 F. However, eggs may also be kept at room temperature in an appropriately-warm attic or similar location. Depending upon temperature and humidity, the eggs will hatch in 30-50 days. Please post below for detailed information on incubation. Hatchling Green Anoles frustrate many hobbyists. They are aggressive towards smaller cage-mates, prone to desiccation, and need ample exposure to UVB. But in my experience, most failures are due to nutritional deficiencies. They will not thrive on pinheads and fruit flies alone. Providing dietary variety can be difficult, given their size, but there are many options. “Meadow plankton”, leaf litter invertebrates, tiny moths, termites, sap beetles, flour beetle grubs and other small invertebrates are essential. Insect traps such as the Zoo Med Bug Napper will assist in the collection of tiny moths and other flying insects. The information in this article on Feeding Poison Frogs is largely applicable. Please also post your questions below.